Disclaimer: The materials contained in this web site have been prepared by the Law Offices of Stella Espinoza Browne for informational purposes only. The information contained herein is general in nature and may not have application to your particular factual or legal circumstances. These materials do not constitute legal advice or opinions and should not be relied upon as such. Transmission of the information is not intended to create, and receipt does not constitute, an attorney-client relationship. Visitors to this website should not act upon any information in this web site without seeking professional counsel. The contents of this website may be an "Advertisement" as defined by The Rules of Professional Conduct and California Business and Professions Code. All rights reserved. If you or a loved one have been arrested and charged with a crime or if you have learned that you may be the subject of a criminal investigation, the single most important thing you can do is hire an attorney to represent you to defend the charges against you. 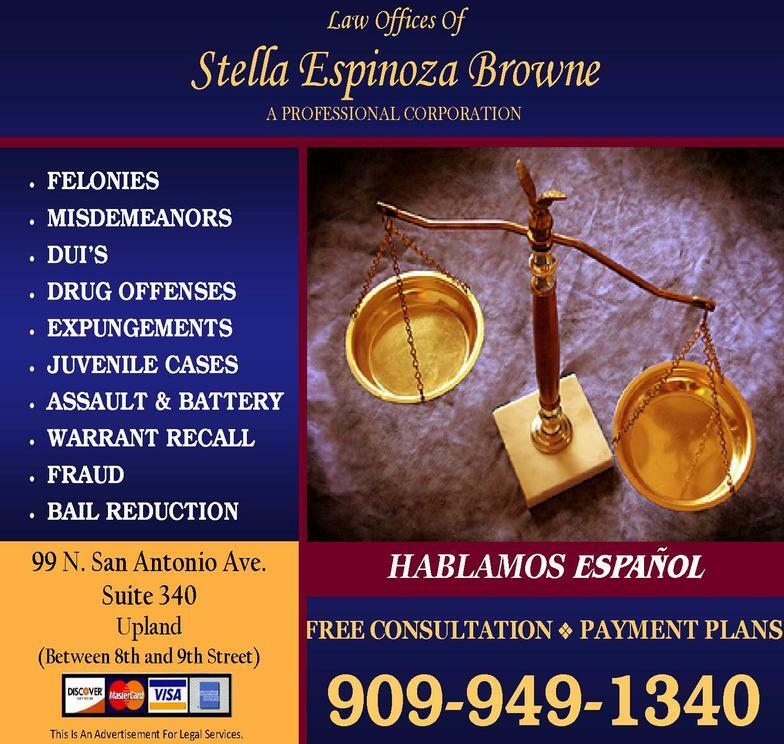 The Law Offices of Stella Espinoza Browne understands that being accused of a crime can have devastating consequences for the accused and their family - even if all charges against them are dropped or they are acquitted. Our office will ensure that you are informed during each phase of your case and that each case is handled with the utmost sensitivity. We will work diligently to obtain the best possible outcome in your case! Despite what the Prosecutor or the police may tell you, there is no such thing as an "open and shut" criminal matter. Our office can help you attack various aspects of your case to protect your liberty and interests.